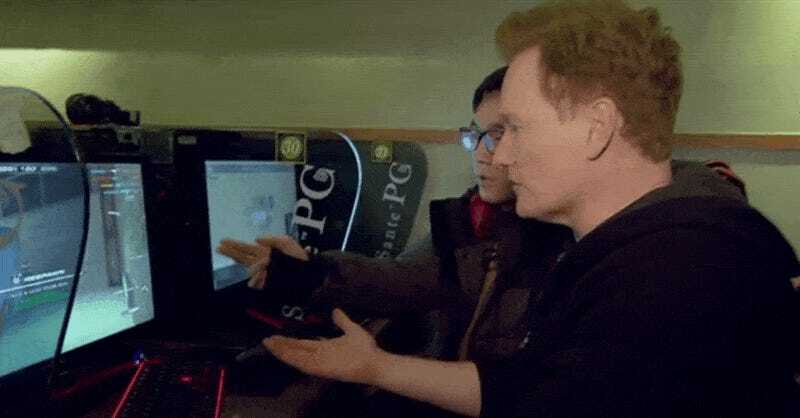 During his recent trip to Korea Conan O’Brien stopped by a PC bang, a place where teens and young adults gather to play bizarro Counter-Strike and really old StarCraft. I couldn’t decide which moment was weirder—Conan somehow getting a headshot or the moment the blue bear with the axe shows up, so I shared them both. I would have used the StarCraft bits, but I didn’t want anyone falling asleep before getting to the video proper. Note: The headline originally mentioned Counter-Strike, but as a reader pointed out in the comments the “Korean Counter-Strike” mentioned in the video is actually Nexon’s Sudden Attack. The lede has been left intact because it sure looks like a bizarro Counter-Strike.